The dissertation of Tutin Aryanti discusses women’s access to public religious spaces, focusing on mosques. Incorporating spatial and architectural theories, it examines how the usage of space [in mosques] by women reflects gender relations. It also highlights how spatial practices can be a way to exercise power and agency in public religious spheres. In the Gedhe Kauman Mosque women were empowered through participation and agency. The Javanese and monarchial context and existing sultanate patronage provide a unique background to the study. The author remarks that existing works on Javanese architecture mostly discuss mosques from spatial and architectural perspectives only, usually not taking into account women’s’ presence in mosques in the Islamic world (p. 115). This might be the case because from a theological point of view, it is believed that [Muslim] women are not recommended to pray in public religious spaces like mosques. The first introductory chapter of the dissertation provides background information, as well as the research design. This part is also supported by a brief geographical and historical overview of Islam in Indonesia, especially in Java, and the sultanate patronage. It sheds light on the history of the Muhammadiyah and its founding father, Kiai Haji Ahmad Dahlan and his wife Nyai Walidah. Both individuals influenced and inspired women’s thought for ‘emancipation’ in Java, perhaps more particularly in Yogyakarta where they mostly initiated their socio-religious activities/reforms. As this study is specifically based on the Javanese context, as well as the Javanese sultanate patronage, it might raise questions in how far this research can be generalized to other Indonesian Muslim women’s situation beyond this specific cultural and political context, such as Minangkabau, Aceh, and so forth. In the theoretical and methodological chapters, the author discusses the theoretical framework that also challenges existing Western feminist theories and points out that they might not be pertinent when examining women in non-Western contexts. The author utilizes her personal knowledge to analyze the understanding of her female informants’ usage of the spatial arrangements of the mosque. From this point of departure, the author problematizes the issue by investigating whether separate spaces for men and women can serve to empower women. This question is significant to understand gender relations in their spatial particularities of religious arrangements within Muslim societies. Chapters four, five and six are devoted to answering the given question. The author explores how spatial usage also implies spatial-hierarchical relations between men and women. In the Sultanate mosque of the palace in which women are invisible, they are secluded in the Keputren mosque where additional rules—such as clothing requirements—are also applied. This spatial arrangement in the mosque, as well as the control over the bodies’ appearance, indeed “serve as social system of communication that deliver the message of gender relation in the palace” (p. 193). The author follows Foucault’s theory of “political technology of the body” (p. 194) in which the body becomes a useful force in preserving the Sultan’s ideology and representing his power” (p. 197). Tutin Aryanti referred to Keputren as harem. It is disputable whether the concept was founded in the Islamic Middle East or Ottoman Empire; or whether it indeed has originated within the Javanese kingdom tradition before the penetration of Islam, and exemplifies how Islamic values color the history of Islam in Java and the archipelago. There are patterns of segregation or seclusion of women’s prayer space, and this also relates to particular historicities. The Gedhe Kauman Mosque, as Tutin shows in her work, has more dynamic practices with regard to the spatial arrangements for women’s prayer spaces. The changing of women’s prayer spaces/quarters from seclusion to higher visibility behind the male congregation, started after the Muhammadiyah national congress in 1967. During this time, women started to pray behind the men’s congregation and this practice still continues today. A few years later, women also started to preach before mixed audiences in the mosque religious dakwah, regardless of the notion of the women’s voice as awra. Some women were then also elected to be on the board committee just like their male counterparts. This suggests that physical spaces could be negotiated, which also further enabled an abstract form of relative ‘power’ and agency. Throughout the dissertation, the author argues that the seclusion of women to a small space or female-specific mosques or musalla does not necessarily limit their public roles. Instead, she believes it facilitates women’s religious leadership over their own congregation: women lead prayers for women’s jamaah (congregation), and also they conduct Islamic teachings and learning activities among themselves, such as the case of Musalla Aisyiah and Ar-Rosyad. The author argues that the spatial segregation is not identical to a form of inequality. Instead, by referring to contemporary studies, it shows that “despite seclusion in private quarters, historically women had significant roles as patrons of architecture and controlling vision over public space “ (p. 226). This particular argument challenges Western feminist theories in which equal access to public space is a pre-requisite for gender equality modalities. As Saba Mahmood (“Feminist Theory, Embodiment, and the Docile Agent: Some Reflections on the Egyptian Islamic Revival,” Cultural Anthropology 6(2): 202-236, 2001) maintains in her work on women in the Egyptian Islamic revivalism: “female agency in the Islamic World is not based upon the enactment of resistance and subversion” (p. 226). The reality might seem like a double standard in the eyes of Secular feminists in which women’s public participation is encouraged, while asserting subservience to the existing patriarchal system (p. 267). In fact, by looking at the figure of Nyai Walidah and some other nyais of pesantren, the space of relative power and agency are derived from their male immediate families, either from their husbands or fathers. Also as Afsaruddin (Asma Afsaruddin, Hermeneutics and Honor Negotiating Female “Public” Space in Islamic/ate Societies. Boston: Harvard University Press, 2000) points out in her edited volume that female ‘public’ spaces are also ‘public,’ but not mixed with their male counterparts. It is a specificity of Muslim women’s public space that women are required to comply and maintain values that perform honor and modesty. The discussion of spatial arrangements in mosques by Tutin Aryanti challenges existing realities that equate the history of Islamic architecture with the history of male patronage. Based on the poststructuralist concept of space, this work treats the spatial architectural arrangements not as static and monolithic concepts and products, but rather a dynamic and changing discourse over time. This work offers ideas about the interconnection of physical spaces and women’s relative power and agency. It serves as an important reminder that the social, cultural, political context has to be embedded in examining the physical architectural arrangement and spaces for its wider meaning and translation. University of Illinois Urbana-Champaign. 2013. 346 pp. Advisor: Fairchild Ruggles. 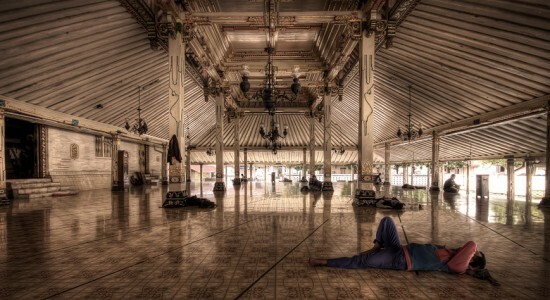 Image: Mosque in Yogyakarta, Indonesia. Wikimedia Commons.